Los Angeles Ocularist Team | Ocular Prosthetics, Inc.
At Ocular Prosthetics, Inc. we offer a very unique experience when designing your custom made prosthetic eye. 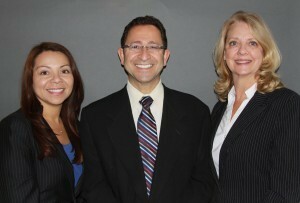 Stephen E. Haddad provides an expert team of board certified ocularists; which includes Beverly Hoffman-Fuglsby, Tania Faulds, and himself. Each ocularist has had extensive training in the fitting and fabrication of prosthetic eyes. Beverly Hoffman-Fulgsby, Board Certified Ocularist, Board Approved Diplomate Ocularist, began her training over 40 years ago under the supervision of Robert Levy. Mr. Levy was the previous owner of Ocular Prosthetics, Inc. before Stephen Haddad acquired the practice in the fall of 1991. Tania Faulds, Board Certified Ocularist, began her training under Mr. Haddad over 15 years ago. With three board certified ocularists and over 75 years of experience in the field, Ocular Prosthetics, Inc., is able to offer each patient the highest quality care possible. The board certified ocularist team works closely together to ensure that the best outcome is reached in each and every case. This team approach to patient care is unique to the practice; encouraging peer review and technique innovations. We invite you to experience all the team has to offer today. Please call or e-mail us today for a consultation at any of our five Southern California office locations: Los Angeles, Orange, Encino, Torrance, and Santa Barbara.